Today we continue the conversation with our investment industry veteran, who began telling us the story of investment banking to the buy side. In Part 2 here, we’ll talk about what it’s like to work at a mutual fund vs. hedge fund. Working at a mutual fund vs. hedge fund has a lot of similarities on the surface. After all, it’s all about investing! However, as we dig deeper into the comparison, we’ll see that there’s are significant differences in the lifestyle, nature of work, compensation structure, and career trajectory. Some of the answers might surprise you. Without further ado, let’s get right down to it and continue our conversation. If you haven’t read the first half of the conversation, I recommend you start with Part 1 here. When I recruited for the buy side as an investment banking analyst, I thought it would be fairly easy. After all, everybody said that investment banking was the best career path to a hedge fund. After going through the process, however, I can say from experience that there’s no easy way to the buy side. Not even for investment banking to hedge fund. Today, we speak to an industry veteran who has done it all: engineering, investment banking, family office, hedge fund, and mutual fund. Very few people have this level of insight on how to get to the buy side by making multiple career transitions. Needless to say, a lot of networking and career planning was involved. We’ll talk go over this person’s career in detail: networking, recruiters, nature of work, the difference between investment banking and hedge fund, and whether it was worth it. Do I have the right background for hedge funds? Self-confidence can be elusive, especially when you are trying to break into investing, one of the toughest careers to get into. Give yourself credit, though. Just making that career decision alone speaks volumes about you. 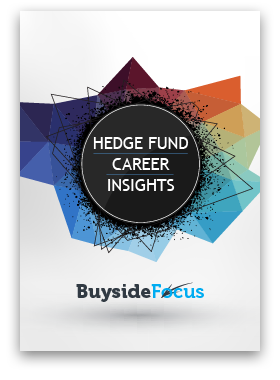 Remember the moment that you put your foot down on having a hedge fund career? That was already a major vote of confidence in yourself. Yet, why do so many of us doubt ourselves as we dive deeper into the hedge fund job search? Why do we have constant insecurities about whether we have the right background for hedge funds? This self-doubt is pervasive. It affects everybody who has ever thought about making a transition to asset management. I mean everybody, from the ex-Goldman Harvard Business School grads to the liberal arts college seniors.